Lately I've been in a very outdoorsy mood due to the small improvement in the weather in the UK. I've gone from wanting to be curled up in bed watching Netflix, to going on little countryside walks! Our garden recently just had a makeover which makes me even more excited for Spring/Summer! 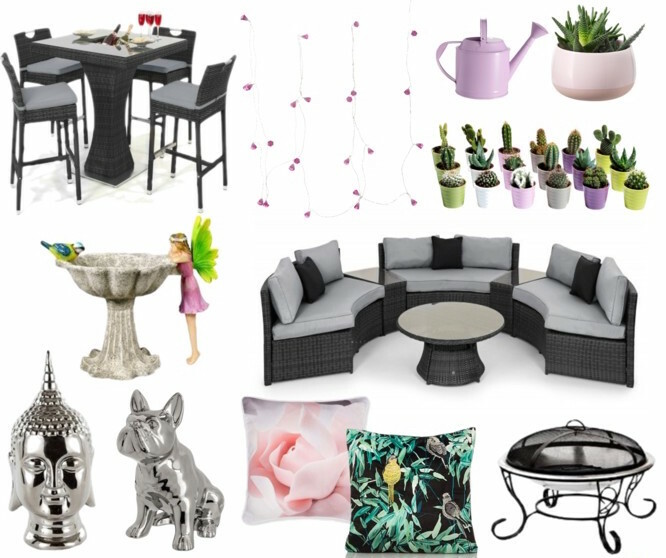 Combining my recent love for the outdoors with my even more recent love of Pinterest (you can follow me here), I had a go at creating a little 'Garden Inspo' board. Now obviously the main event here is that gorgeous sofa set! The thing I actually love the most about this is each segment can be removed and re arranged as you please. You could even swap out that little table for a fire pit in the evening! Now if your garden isn't big enough for a sofa like mine, you can't go wrong with a dining set. Both the sofa and dining set are from Fishpools' Garden Range which you can find here. Accessories are key to giving your garden some character. The floral cushions add a pop of colour to the grey sofa, whilst the silver ornaments make more classy, effortless additions. Coloured fairy lights also make for a cute pop of colour in the evening, you could maybe string them along your fence if you have one. In my garden, we have a little birdhouse, which I struggled to find so I instead chose this adorable little bird bath which I think would look lovely at the bottom of the garden! And what's a garden without plants? Ikea do a great range of small decorative plants if you're not looking to grow your own veg or anything! Half Moon Sofa Set available here. Dining Set available here. Both from Fishpools. Firepit, Budha & Bird Bath from Very. Fairy Lights, Watering Can and Small Plants from Ikea. Silver Dog from Debenhams. Rose Cushion from Ted Baker/Next and Leaf Cushion from Asda. *post in collaboration with Fishpools. All words and opinions are my own. I am so excited for Spring, I can't wait to go on long walk and not be freezing!!! Ahhaa!! That sofa set is amazing 😍😍 I love the circular layout, it'd be perfect for sitting and chatting with groups of friends as nobody would feel left out! That little silver dog model you picked out is just so cute as well! I absolutely adore home inspo! Loved this post. Love the fairy lights and plant pots! They're perfect for the garden! Ooh I love the looks of this! I can't wait for it to be warmer. I need garden inspo (& a lawnmower). Seriously this is refreshing, I'd like to see the end product! Those cushions are so pretty, my fave is the leaf print...give me anything leaf printed and I'll be good ha. The buddha head is so cute too. Love reading home inspired posts! Can't wait until my partner and I finally move. Definitely on the hunt for a house with a decent size garden. It's great being about to spend time outside as much as possible in the nice weather. Love that sofa set, the pug and Buddha! reading this has made me so excited for the warmer weather, where you can spend days out in the garden without a gazzilion layers! Can we just take a moment for how adorable everything you picked out is?! Style inspo!These are one of my favourite types of posts to read! Those cushions are super cute, they'd look perfect on my sofa to add a nice touch of colour ! Oh my goodness I love those cushions! I picked up some a fake plant and fake succulents from Primark yesterday and I LOVE them, I'm ready for spring now! Those sofas look gorgeous wish I could skip uni and have my own house so I can make it all pretty.